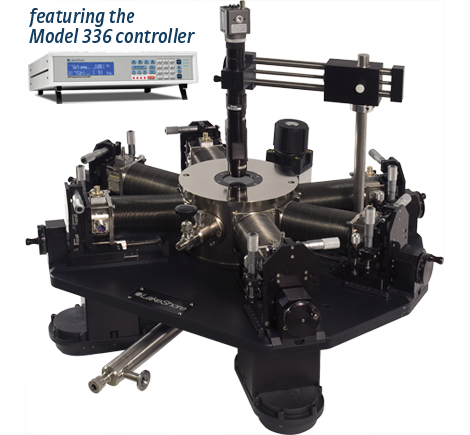 The Model TTPX probe station is an affordable, entry-level probe station capable of making a wide variety of non-destructive, standard electrical device measurements. The compact table-top design is perfect for academic and laboratory research settings. The TTPX provides efficient cryogenic temperature operation and control with a continuous refrigeration system using either liquid helium or liquid nitrogen. The TTPX operates over a temperature range of 4.2 K to 475 K with options to extend as low as 3.2 K or to a higher range of 20 K to 675 K. This model accommodates full and partial wafers up to 51 mm (2 in) in diameter. A wide selection of probes, cables, sample holders, and options makes it possible to meet specific measurement applications.